A La-Ce-Sr-Ca aluminous hydroxy phosphate of the goyazite-florencite-crandallite series was observed in the nuclear reactor zone 13 in the Oklo uranium deposit (Gabon). It has a trigonal elementary cell with a = 6.98 ± 0.03 Å and c = 16.35 ± 0.04 Å (space group P3m). It occurs in a U-rich sample depleted in 235U (235U/238U = 0.0047). Its chemical composition, measured by ion microprobe analyses, shows that it contains fission products (Zr, LREE) whereas the isotopic composition of Ba and Sr is natural. Ion microprobe imaging indicates that the nearby uraninite crystals are depleted in fissiogenic LREE. 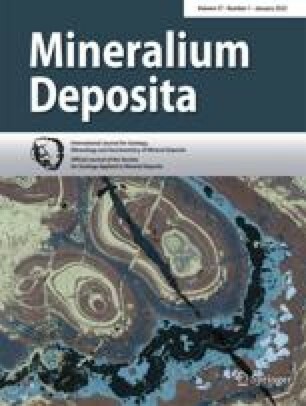 This study shows that the migration of some fission products, probably related to a dolerite dike intrusion, is limited by the formation of aluminous hydroxy phosphates.